We’ve all been there before where you are invited to a wedding, and you’re unsure if you’ll know anyone else there. You were probably sat table 19. That’s the table where all of the odd pairings and random guests are sat in the corner of the ballroom. Anna Kendrick stars as Eloise, the former maid of honor and ex-girlfriend of the man of honor (Russell). She’s a bit of a mess when the film opens due to her recent breakup but decides to attend the wedding. There’s also Bina (Kudrow) and Jerry Kepp (Robinson) who are friends of the parents and are in the midst of their own marriage squabble. 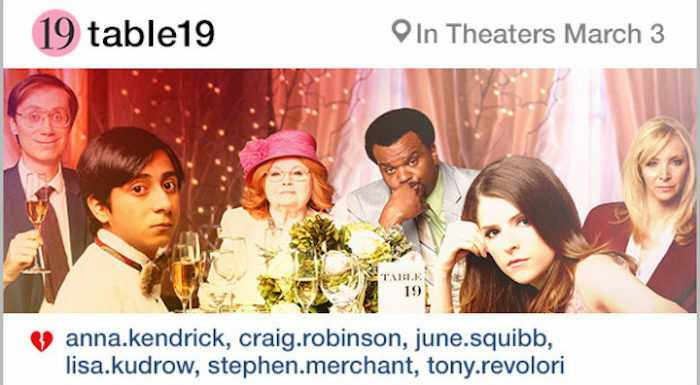 Other members of table 19 include the bride’s former nanny (Squibb), a random high school kid (Revolori), and the groom’s uncle (Merchant) who is fresh out of prison. The members of table 19 begrudgingly sit through the reception as they get to know each other. They offer a bit of support for Eloise who continues to crumble as she is forced to confront her ex. As the night passes on, different truths are revealed and frustrations come to light, but this group of strangers realizes the wedding may just what they needed after all. Table 19 is credited with a story by Mark and Jay Duplass but was written and directed by Jeffrey Blitz. The Duplass brothers are best known for creating the HBO show Togetherness and the movie Jeff, Who Lives at Home as well as acting in a variety of TV and film projects. Blitz has mainly worked as a director on the Oscar-nominated Spellbound and a smattering of episodes of The Office. He has few writing credits to his name, and this film is evidence to that. It may have been better to have the Duplass brothers write the actual script. They have a smarter and more precise sense of humor and pacing. Table 19 has an interesting and relatable premise, but it takes too long to get the story going. To open with Anna Kendrick crying and burning the invite doesn’t set her character up in a positive light. We do find out why she is conflicted later on. The rest of the first section involves the arrival of the guests to the reception waiting on the token reception events to start happening. Knowing that receptions are often the end of the evening makes it seem like we should already be at the climax of the movie. Much like an actual wedding, we’re left with awkward small talk as the members of table 19 get to know each other and figure out their connection to the bridge and groom while Anna Kendrick’s Eloise continues to make a fool of herself. The actual story only starts to come together in the second half once table 19 starts to band together and leave the ballroom heading out for their own adventures involving a puppy, marijuana, marital arguments, and a potential new love interest for Eloise. There is some heart to be had in this section as different truths about these characters get introduced into the mix. It feels a little too late to care by this point. As I was watching the movie, I felt like a member of table 19 as I didn’t want to be at that wedding thus making the movie itself feel a bit unoriginal and uninspired. It relies too heavily on easy wedding clichés including: a drunken mom making a scene, bad speeches, karaoke, ugly dresses, and cake mishaps. They’re thrown in for easy laughs but wind up flat. How many times can you see a character accidentally fall into the wedding cake? It boasts a normally strong cast with Anna Kendrick, Lisa Kudrow, Craig Robinson, June Squibb, and Stephen Merchant as the rogue members of table 19. Given the talent of the cast, the film isn’t consistently funny. Kudrow and Merchant come out the best playing into their strengths. Kudrow has some pivotal scenes with Craig Robinson who plays her husband. There are confrontational moments between them that showcase her abilities to be a strong actress. She knows how to the play the truth in order to find the laugh versus mugging for it. Table 19 feels like an episode of a sitcom that’s been stretched to 90 minutes. It attempts to be humorous and have a heart by the end. It has both, at times, but the road to redemption and happiness for these characters is far too wandering to get there. The audience shouldn’t always have to wait around in the same fashion the characters are, but Jeffrey Blitz keeps us waiting. Maybe if there were flashbacks or a better build up in the exposition to who these characters are it would make the ending all the more meaningful. Mid-movie revelations and twists don’t always bode well for comedy. Is It Worth Your Trip to the Movies? Not enough laughs to make it a memorable wedding.